• Why organized crime accounts for ten percent of the United States’s annual income? • The name of the first CD pressed in the United States? • The last year that can be written upside-down or right side-up and appear the same? • The shortest performance ever nominated for an Oscar®? • How much Elvis weighed at the time of his death? • What the suits in a deck of cards represent? • How many Quarter Pounders can be made from one cow? 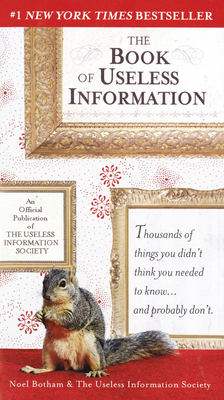 • How interesting useless information can be? The Book of Useless Information answers these teasers and is packed with facts and figures that will captivate you—and anyone who shares your joy in the pursuit of pointless knowledge.